The beautiful Yorkshire Dales is a delight to visit. It looks brilliant from the seat of a Bristol L single deck bus, and even better from an open top bus, especially if that bus is a early mark 2 Bristol VRT with a flat front! Come and join us on board these two fine vehicles. Vintage Omnibus Services based near West Tanfield in the Yorkshire Dales operate service 127 from Ripon to Garsdale via Hawes. In early August 2016 the independent transport videos cameras were invited back to film one of the Tuesday journeys, but this time with a difference! The usual vehicle for this journey is either former United Automobile Bristol L5G BG381 (LHN 823) that featured on our last programme filmed in 2009, or it’s stable mate, former Lincolnshire Road Car 749 (FFW 830) a 1949 Bristol L5G also with an ECW B35R bodywork. On this journey the Lincolnshire vehicle was used along with recently restored former Eastern Counties, originally Ribble, OT5 (OCK 995K), a 1972 Bristol VRT/SL/6G with an O70F body, making its one and only appearance on the service! Our day begins at the tiny Vintage Omnibus Service depot set in the Yorkshire Dales. We journey in the L5G to Ripon Bus Station to meet up with the VRT that is waiting to duplicate the 0940 departure with the L type on service 127. Both vehicles set off from Ripon on the long journey to Garsdale via the pretty town of Hawes. There is plenty of action for you to enjoy as our cameras film from both vehicles, coupled with the sound of the Gardner 5 cylinder engine of the L type and the much larger Gardner 6 cylinder engine and semi-automatic gearbox of the Bristol VRT. The superb scenery looks great passing the windows of the L type and from the top of the VRT! Our route takes us through West Tanfield, Masham, and Leyburn to Redmire Station where we visit the Wensleydale Railway and see a former BR DMU in action! From here we journey to Hawes passing Bolton Castle, the Aysgarth Falls and many pretty villages. From Hawes we make the journey to Garsdale Station where we see the Settle to Carlisle railway line and then return to Hawes to meet up with the VRT for the journey back to Ripon. Sid Parker, our conductor on the VRT, is also an artist. We feature some of his paintings of buses at the end of this programme. We would like to thank Chris Bulmer of Vintage Omnibus Services for his invitation and help with the filming on the day. 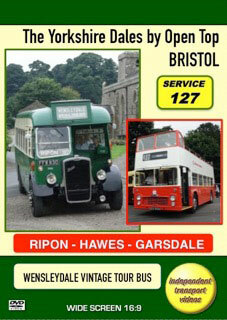 Also to Neil Halliday for bringing his Bristol VRT, that is currently operated by the Keighley Bus Museum Trust. We would also like to express our thanks to conductors Sid Parker and Don McKeon and assistant Ian Hunter. Now take your seats and enjoy the ride!